Yamaha Motor: Breaking into the core of the Indian scooter market Release of the new family-oriented "CYGNUS α (alpha)" - News Releases | Yamaha Motor Co., Ltd.
Yamaha Motor Co., Ltd will release its new 115 cc scooter CYGNUS α (alpha) for the Indian market this month. The new model will be exhibited at the 12th Auto Expo, held from February 5th in Delhi, India. CYGNUS α is the first scooter released by Yamaha for the family category, which is at the core of the fast-growing Indian scooter market. CYGNUS α incorporates practical functions such as comfort, storage and handling in a modern and refined body design. The new model also has the same engine as the CYGNUS RAY series, offering excellent performance and economy. Major features include 1) combining smooth take-off/acceleration and excellent fuel economy, 2) seat design that provides stable footing position, and comfortable for two up riding, 3) storage large enough for a full-face helmet,* and 4) lightweight model for ease of handling and an assuring ride. CYGNUS α will be manufactured and sold by Yamaha Motor's group company IYM (India Yamaha Motor Pvt. Ltd.). The motorcycle market in India is the world's largest at over 14 million units (2013/Yamaha Motor data). In addition, sales of scooters in India have been rapidly increasing in recent years. 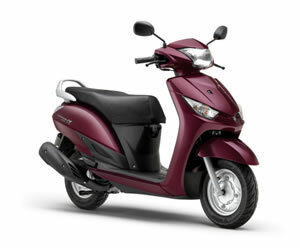 The Indian scooter market was recorded at 2.4 million units in 2011, and this figure is expected to reach 3.6 million units in 2014 (Yamaha Motor forecast). In India, scooters are often shared by the owners' family. For this reason, family-oriented models with larger frames take up a significant proportion of the market. Yamaha entered the Indian scooter category in 2012 starting with CYGNUS RAY designed for young women, which was followed by CYGNUS RAY Z in 2013 intended for young men. Both were developed with younger riders in mind, and have sold approximately 180,000 units by the end of 2013 thanks to its stylish design and ease of use.